Decision: Should You Play Grievous Riposte? Author's Note: Today's article is inspired by Daniel Greve who asked me to do an analysis of this card on the Warhammer Underworlds Community page on Facebook. Thanks Daniel! While it could be useful in decks that stack defensive bonuses, it's likely that even those decks will find better uses for their ploy slots. We will examine each of these separately, then look at the odds of actually being able to score it. Let's start by looking at the number of Range 1 attacks. As mentioned in the FAQ, to be considered a Range 1 attack, the attack's Range characteristic must actually be 1. This means that a Range 3 attack performed from one hex away won't trigger Grievous Riposte. The majority of the attacks in Shadespire (just over 3/4) are Range 1 attacks. Below is a breakdown of the number of each type of attack that the warbands can bring to the table. However, it should be noted that the strength and effectiveness of these attacks is not taken into account by this table; you may face a warband with many Range 1 attacks, but never be targeted by them (Farstriders, for example). While not terribly relevant to the discussion of Grievous Riposte, it is worth noting that the majority of range 3 attacks have been added to the game post-Nightvault. In fact, before the release of Farstriders, there was not a single base attack with a Range of 3. If you are facing off against Orruks, Dwarves, or the like, you're quite likely to meet the first requirement of scoring Grievous. You are significantly less so against some of the newer warbands. Keep your local/tournament meta in mind when deciding whether or not to play Grievous (or any card, really, you coconuts). There are really two ways to score a successful defense roll in Shadespire. In many cases, a successful defense is really just a failed attack roll; ie. a roll where your opponent scores no successes. When your opponent does manage to come up with 1 or more successes, you can still cause the attack to fail by rolling at least as many successes in your defense roll. Let's look at both of these scenarios. In the first scenario, your opponent rolls no successes on their attack roll. You can view the exact odds of this happening in the chart on this page. While we won't rehash the whole chart here, it's worth noting that with base attacks on fighter cards, the chances of a "natural miss" range from 66.67% (Spartacus Chainrasp) to 6.25% (Inspired K'Charik). In the second scenario, your opponent rolls one or more successes, but you outroll them. The odds of this happening are entirely dependent on the type and number of dice rolled, and are quite a bit too intricate to lay out in their entirety here. You can always refer to this hideously-designed-but-very-accurate chart for reference, or pick up Warband Odds for on-the-fly calculations. Within the realm of base attacks and defenses on fighter cards, the odds of an attack failing in this way range from 85% (Phillipe Bourbon Chainrasp vs. Inspired Snirk) to 24% (Inspired Bonekrakka vs. Garrek). 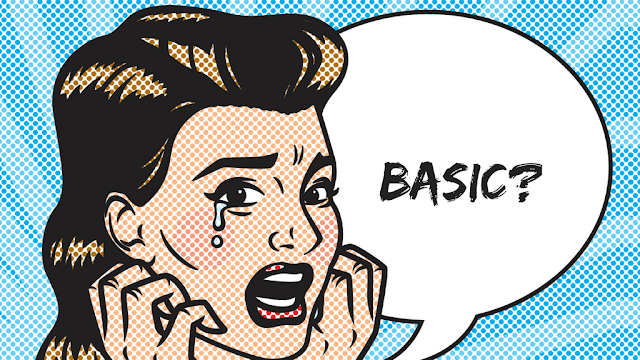 One last note: if you are playing this card, it's especially important to roll your dice. Particularly in casual/semi-casual games, we are likely to simply not roll the defense dice if our opponent misses their attack entirely. While rolling the defense dice verses a "natural miss" may feel a bit like rubbing it in (and may slow down play slightly), you can't use Grievous if you don't roll a crit - and you can't roll a crit if you don't roll the dice. It's pretty obvious that Grievous is more valuable in metas that lean heavily toward low accuracy attacks - and these attacks tend to be on the weaker fighters in large warbands (ie. potatoes). If your environment is full of potatoes, you'll get far more use out of Grievous than if you're mostly finding yourself up against Shieldbois and Stormdaddies. Obviously, models with better Defense characteristics are going to potentially trigger Grievous more often than models with worse characteristics. However, in terms of rolling criticals, the number of dice rolled is going to be more important than the block/dodge paradigm. While Stormsire is slightly (+3%) more likely to fend off a 3-Hammer attack than Inspired Batsquig, for example, Batsquig is significantly (+12%) more likely to score a critical in the process. Therefore, the more dice your models roll on their defenses, be they shield dice or dodge dice, the better off you are including Grievous Riposte in your deck. Obviously, rolling shield dice is better for increasing the chance of a successful defense (see above), but dodge dice serve just as well for rolling criticals. Furthermore, there are - at this time - no models with a base 3-shield defense, so if you're looking to roll 3 defense dice, you'll need to count on dodges. A couple of things are worth noting. First, to accurately calculate the average defense, the number of models in each warband was doubled, representing the inspired/uninspired sides of the cards (horrors were counted as a single model). Second, the numbers here can be a bit deceptive; for example, Mollog's Mob has the highest average defense characteristics, but their main model rolls only one die on both sides. Regardless of the idiosyncrasies of the chart, it appears that Mollog's Mob, Thorns, Gitz, and Spiteclaw's Swarm are all well positioned to use Grievous, while warbands like Orcs and Dwarves should probably stay away. As is so often the case (except with cards haunted by The Helium Problem), the usefulness of Grievous Riposte is heavily dependent on the other cards you are playing. Just as we did above, we can divide those cards into three categories. First, we have cards that increase the number of Range 1 attacks that you will face. At the time of writing, that subset includes exactly one card: Darkness Descends. Unfortunately, the opportune time to use Darkness is when all of the enemy models are far away - making it not terribly useful in combination with Grievous. While Cloak of Shadows doesn't technically create any more Range 1 attacks, it may serve to discourage enemy fighters from using attacks from more than 1 hex away (though they could still use Range 2/3/4 attacks while adjacent to your model). Second, we can look at cards that increase the number of criticals rolled on defense. Currently, there are no cards that convert non-critical successes to crits (like Unparalleled Strike) on defense rolls. The only way to increase your chance of rolling criticals on defense at this time is to increase the number of dice you roll/reroll. Champion's Fortitude and Trusted Defender are both available to any warband, as are the (less good) Cursed Shield/Armor. For dodge-based armies, Acrobatics is the pinnacle of defense dice increases. Finally, many warband- and model-specific defense dice increases are available across the board. It's worth noting that increasing the number of defense dice you are rolling will also help you successfully defend against attacks, improving your chances of being able to use Grievous Riposte in two ways. Finally, we can look at cards that will increase your chance of successfully defending against attacks. Cards like Curious Inversion, Sphere of Ulgu, and Horrifying Armour can all increase your opponent's chances of rolling a natural miss. Similarly, there are a plethora of cards that will increase your chance of rolling a successful defense without increasing the number of dice you roll; Ethereal Shield, Curious Inversion (again), and Sphere of Chamon (for 1-dodge fighters) can all help out in this way. If you are unlucky enough to fail your defense roll, you can also take advantage of cards that make attacks auto-fail like Rebound, Tethered Spirit, and Last Chance. It's also worth mentioning a few popular cards that "non-bo" with Grievous Riposte. Haymaker and Aggressive Defence both prevent you from playing Grievous, while cards like Light Armour will drastically reduce your chances of meeting the three requirements to play it (without completely negating your ability to do so). 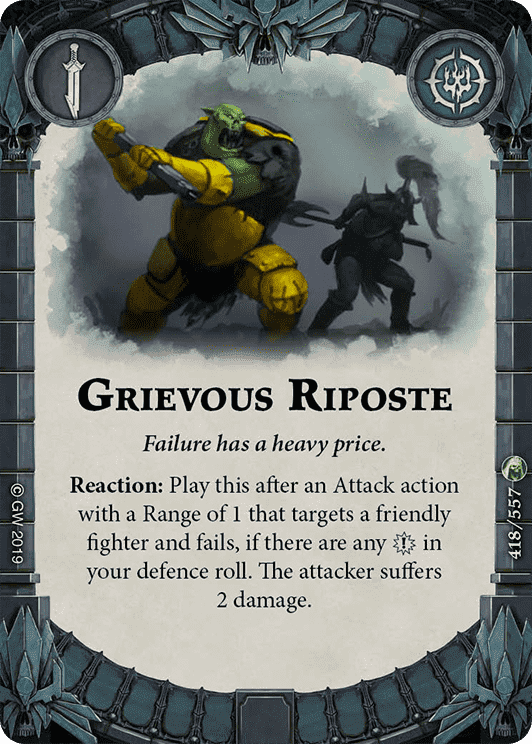 If you're playing a lot of these kinds of cards already, Grievous Riposte probably isn't the card for you. 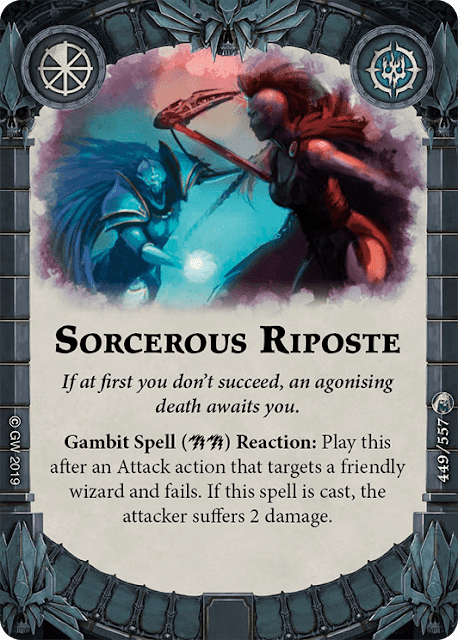 As you can see, if the attack targets an eligible wizard, the odds of being able to strike back with Sorcerous Riposte are much higher than they are with Grievous Riposte. However, Grievous Riposte can be used by a much larger selection of warbands. In the end, if you feel you must play one of these cards, it's likely a case of personal preference as to which one to include. If you don't stack cards to help you trigger Grievous Riposte, it's pretty unlikely to be playable on any given attack. Even in the best case base-fighter scenarios, an average attack is not going to meet all three requirements for playing Grievous Riposte very often. On average, roughly 25% of attacks aren't even able to trigger Grievous, due to their Range characteristics. There's not enough data available to determine which attacks are used more and which are used less, so our best method of calculating that at this point is to use a random-average. Even in the worst attack/defense matches, the attack will still succeed around 15% of the time, causing Grievous to be unplayable. 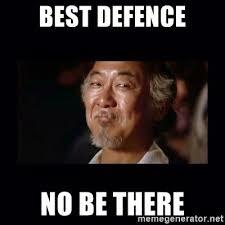 Finally, even if you successfully defend, even the best base defenses aren't going to roll a critical around 58% of the time. Therefore, even on a best-case scenario against an attack with a random-average Range characteristic, you'll only be able to use Grievous Riposte 26.8% of the time. Even if we eliminate the Range requirement (by only considering Range 1 attacks) the best case scenario available to us through unmodified base attack and defense characteristics (1-sword vs. 3-dodge) attacks will only allow us to play Grievous about 35% of the time. Conversely, in a worst-case attack situation (3-hammer vs. 1-dodge), you can only play Grievous roughly three percent of the time in against a random-average Range attack, and only 4.5% of the time against a Range 1 attack. If we assume that your opponent manages an attack on every single available activation of the game (ie. a 12-attack game, an example that we used to examine Peerless Fighter in a previous article), we can look a little further into how likely Grievous is to trigger. Just like above, the best way we can estimate attack success over multiple (necessarily unpredictable) attacks and defenses is to use a random-average method, using weighted averages based on the number of times a particular attack or defense characteristic appears in the game (I'm not including that table here, though I can provide it to anyone who really likes numbers, you nerd). When we use this kind of weighted average, we find that a random-average attack against a random-average defense hits - rather oddly - almost exactly 50% of the time. Using the same random-average method, we can determine how likely a random-average defense is going to roll a crit, based on the weights described above. In this case, the end result is 20.8% of the time. We can then put all these arcane numbers into our magic spell generator and realize that a random-average attack with a random-average range against a random-average defense will only result in a situation that meets all the criteria to use Grievous about 7.8% of the time. This means that if you just throw Grievous into any old deck in any old meta, you'll only see a situation in which you can even use it in about 62% of your games. While this may seem pretty good, comparing it to the usefulness of a card like Sidestep or Ready for Action (which are likely to be useful in every game) causes it to lose quite a bit of shine. Overall, unless you can guarantee that your opponent will be making a lot of low-accuracy attacks against your high defense characteristics, this card probably isn't worth including.